The DoubleTree by Hilton Aberdeen City Centre has a variety of meeting rooms to suit all of your event requirements. From 1-1 meetings to dinners for up to 140 guests, our meeting rooms are perfect for your forthcoming event. 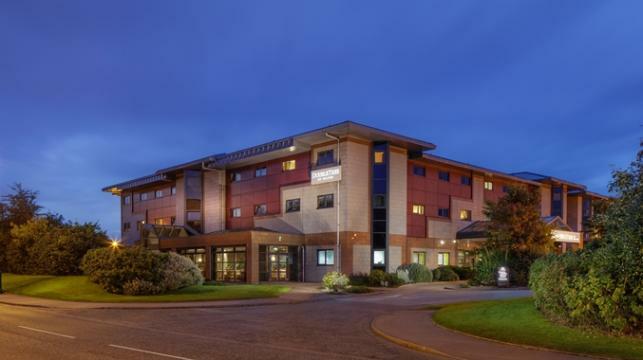 The Balmedie suite, which can be divided into two smaller suites, is located on the ground floor with easy access to Reception and our outdoor area. The room can accommodate up to 170 people in a theatre style or can be used as an Indoor Team Building venue. Our smaller meeting rooms are ideal if you need a meeting away from the office and are great for smaller Team Building events. Theming your event couldn’t be easier with our range of themed menus including Mexican, Chinese and Indian, or why not set us a challenge and allow us to tailor-make a menu to suit your corporate event theme? Our outdoor patio area, which is ideal for BBQs is the perfect setting to complete your Corporate Fun Day at the DoubleTree by Hilton Aberdeen. To complete our service, we also offer preferred accommodation rates for your delegates, ensuring that they get a good night’s sleep before or after your event. Of course, the addition of a warm chocolate chip cookie on check in, is always a welcome addition to any overnight trip.